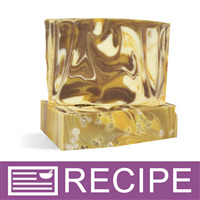 The warm caramel colors are beautifully swirled in this Cold Process soap. The coconut milk adds moisturizing benefits to help soften the skin. INCI Ingredient Label: Rice Bran Oil, Water, Coconut Oil, Palm Oil, Sodium Hydroxide, Fragrance, Coconut Milk Powder, Cocoa Butter, Castor Oil, Titanium Dioxide, Mica, Fluorphlogopite, Iron Oxide, Sea Salt. Mix Coconut Milk Powder into water until dissolved. Pour into a small silicone mold or ice cube tray and freeze. When milk is frozen, measure the Sodium Hydroxide Flakes into a plastic mixing bowl and slowly add to the milk cubes. Mix until all the lye flakes are completely dissolved. Set aside. Measure the oils and butters in a large mixing bowl and melt in the microwave. Set aside. In 2 separate funnel pitchers, measure out the Gingerbread Brown Mica and the Matte White Pigment Powder - For Oil. Add a small amount of the melted oils to each cup and blend well. In a small plastic beaker, measure out the Shimmering Dark Gold Mica Powder and set aside (this will be blended into the large pot of soap batter). When the oils are below 100° F, you can add the milk/lye mixture to the oils. Stick blend until incorporated. Stir in the fragrance/stabilizer mixture by hand. Pour approximately 14 oz. of soap batter into the 2 containers with premixed color (powder/oils). Add the premeasured amount of Shimmering Dark Gold Mica to the remaining uncolored batter. Stick blend all 3 containers to fully incorporate the color (mix from lightest color to darkest so the colors are not changed). Pour the gingerbread brown colored batter in 2 spots and the white colored batter in 2 spots in the large bowl of batter (with the Shimmering Dark Gold Mica). We recommend pouring in halves so that the color will stay in one area. When all the batter is back in the large bowl begin pouring into the mold. The batter will swirl itself as it pours. We swirled the soap further by inserting the chopstick and moving it in a back and forth motion, then circling around the outside edges of the mold to produce a “circling swirl” effect. Tap the mold on the counter to release any air bubbles. Sprinkle top with salt. 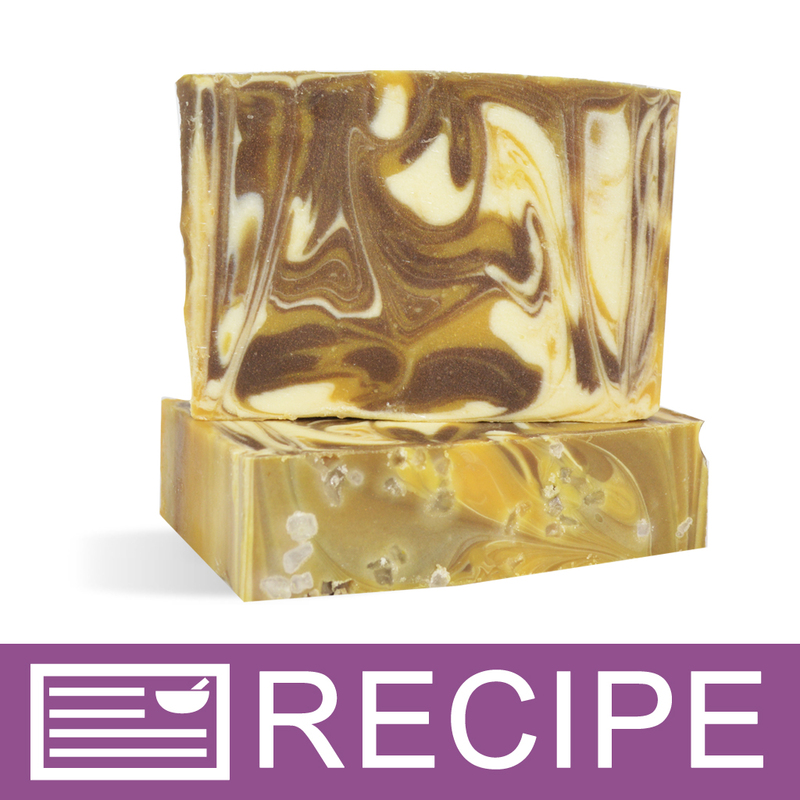 Allow to set at least 24 hours or longer until soap is firm enough to unmold and cut. We do not recommend insulating the mold because this may overheat the coconut milk. Let soap cure 4-6 weeks. "Would this give the same result if I add the coconut milk powder to the oils rather than going through the process of freezing the coconut milk mixture?" "In this recipe, can I use frozen,canned coconut milk, instead of the coconut milk powder and water without recalculating the recipe? " Staff Answer We would recommend recalculating if making any substitutions. "I notice that this recipe has you add the frozen milk to the lye flakes. Is this correct? Most recipes say never to add liquid to lye, but maybe frozen liquids are different?" Staff Answer You are correct in that the lye is ALWAYS added to the water. This recipe does have you add the sodium hydroxide flakes to the frozen milk cubes. It states to "measure the sodium hydroxide flakes and slowly add to the milk cubes".